Global Bird Rescue is a FLAP Canada initiative that will bring the issue of bird building collisions into the hands of the public. This weeklong event, dubbed Collision Count Week, will bring communities together to search for fallen birds in their neighbourhood. 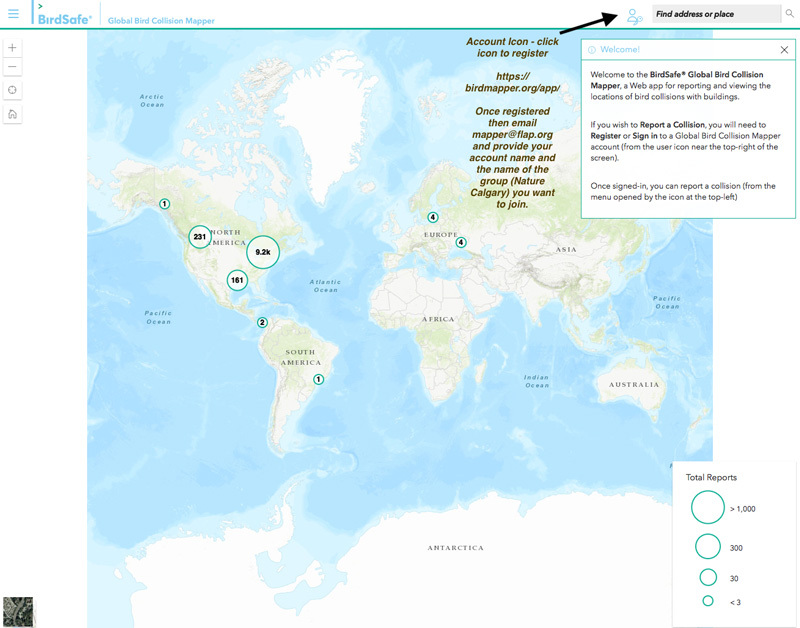 Using the Global Bird Collision Mapper, participants will be able to report the location, status and species of the birds they recover, including the ability to upload a photo of each bird they report. This citizen science tool will show every collision reported on its interactive GIS map, providing invaluable data for a greater understanding of the bird-building collision issue. Additionally, by encouraging people to search for birds, we hope to increase the chances of finding live birds sooner, thus increasing their chances for a successful rehabilitation/release. September 24th through 30th, teams and individuals will take to the streets and to social media to raise awareness about this critical issue. More information available from BirdMapper.org. Learn more about bird-friendly design from City of Calgary bird-friendly urban design guidelines (2011 report). At the top right of the Bird Mapper page, there is an account icon that will pull up the login window. At the bottom of the login window is the register option. Once you have entered your account information, you will need to verify your email address. An email will be sent to you at the email provided and it will contain the verification code. You put that into the Verification Code area on the registration page and then you become a member. The only info they ask for is a User name, your name and email address. Once you are logged on to your BirdSafe® Mapper account, you can enter a collision report under the menu icon.